Do you have a role model that inspired you to go into music? My Nonno (Italian grandfather) inspired me to get into the arts in general, starting in theater. He always had a lovely voice. My family says I inherited music from my Nonno. I sang William Byrd's "Ave Verum Corpus" in what is now Schola Clementis, at St. Clement, several years ago. How/when did you get involved with Marion Consort? I knew Melissa Curtis, who knew I loved early music and told me about auditions! Do you play any instruments in addition to singing? I dabble in piano and guitar. Do you have a favorite piece or concert you've sung with Marion Consort? If I have to pick just one, probably Palestrina's "Exultate Deo"
Anything else you can tell us about yourself or your musical journey? Emma Kirkby was the first voice I heard that made me think "huh, I guess you can be a classical singer without sounding like Maria Callas." My mom had The King's Singer's English Renaissance album when I was a kid, and for whatever reason the sound of Tudor church music really caught my ear. I used to listen to it on repeat while falling asleep and imagining I lived in a castle or something. I really "fell" for Early Music in college; my school's chamber ensemble did an early music concert in the spring each year, which was always a highlight for me. My first church gig was also heavily focused on renaissance music and chant, which deepened my appreciation. I play piano quite badly considering how long I studied it, and took a semester of harpsichord in college for fun. I also can play about four chords on the guitar and like to take out a tin whistle once a year on St. Patrick's day. So...not really. I'm really loving the chant on this concert. It's a bit rare to have the opportunity to sing this much chant, and it's a style of singing unlike any other. You have to read and listen to your fellow singers in a different way than you do on polyphony - it feels like a deeper sort of connection. It's also a bit terrifying as there's no way to hide any mistakes or hesitancies on such simple, exposed lines. Melissa Curtis, soprano, is a founding member of The Marion Consort and runs her own voice and piano studio. I fell in love with early music in my undergraduate studies at Millikin University. The first time I sang a Tallis piece, I was hooked. I am a proud founding member of the group. Amy asked me to join, and I said, "YES"! I play the piano, and I like to pretend to play guitar. My favorite concert was out Ghost Stories concert at the National Bohemian Cemetery. Super cool venue, and AWESOME music!! Listen to one of the pieces from that Ghost Stories concert! Diana Nevills is a soprano in The Marion Consort. She is also a K-8 music teacher in Chicago and President of Ensemble Alioni, specializing in music from the country of Georgia. I credit my parents and childhood music teachers for inspiring me to pursue music performance. Thank you Mom, Dad, Delreen Haffenrichter and Louise May for fostering young talent. I came to know and love Early Music through singing in University Singers at DePaul and the Saint Alphonsus Church Choir. There's something satisfying and smart about singing four part polyphany every Sunday morning for several years. Favorite moment piece and moment with Marion Consort was Gabrieli's antiphonal "O Jesu mi dulcissime" with Khorikos in NYC. Definitely a wow moment. Studied Vocal Performance and Music Education at DePaul University. I'm a rocking K-8 music teacher at USCN Marquez Charter School in Chicago and President of non-for-profit Ensemble Alioni Georgian Choir of Chicago. 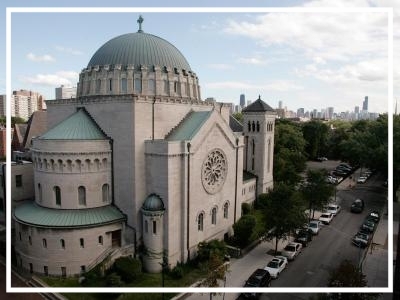 St. Clement is a special community, warm and welcoming, in Lincoln Park. I've been a cantor there since 2008 and I can easily say it's a pleasure to sing in that space. Aside from the people that make up the community and the beauty of the church itself, the acoustics at St. Clement are ideal for this kind of music. Many amazing choral groups have sung at St. Clement and it's an honor to be on that list. I think this concert will offer something special for everyone in a contemplative, sacred space. We look forward to seeing you on February 18. The St. Clement website has an amazing page with a wealth of information (and beautiful photos!) about the Art and Architecture of the building. Here's a a quick interesting tidbit - the original artist for the interior design of the church was born in Russia in 1888. His name was Reverend Gleb Evgeniovitch Werchovsky. Try saying that 5 times fast! As a member of The Marion Consort and a regular cantor at St. Clement, to say I am excited for this concert is an understatement. If you are reading this post, you probably already know the beauty of early music, The Marion Consort and how our voices come together as a group. If not, what are you waiting for? Come hear us!